Have you heard who will replace Annan? It’s Mr. Inaudible! There’s mounting confusion at the UN about who will replace Kofi Annan as the envoy to Syria. Everyone knows that it’s meant to be veteran UN mediator Lakhdar Brahimi. But it’s widely rumored that Brahimi is holding up the announcement because he wants a clear vote of support from the Security Council, which is not so easy these days. Q: Are you confident the country will remain peaceful once the peacekeeepers [sic] leave? And the second question: Mr. [inaudible] …. 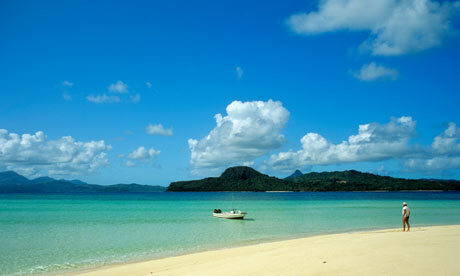 is a strong candidate to replace Kofi Annan, are you going to announce officially here in East Timor? SG: I didn’t clearly understand your first question, but for the second question: I am not in a position to inform on anything about the successor issue of Kofi Annan as Joint Special Envoy for Syria. I am in the process of actively searching for a successor and when I am ready I will certainly announce this as soon as possible. Now we don’t know if the questioner said “Brahimi”. But it’s not a bad guess, and it wouldn’t be too hard to check. But maybe there’s another mediator in the frame: Mr. Inaudible, a master of quiet diplomacy? 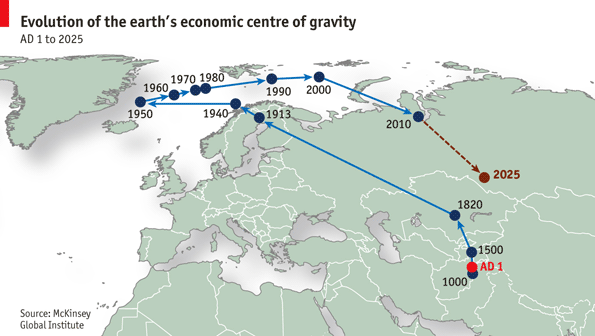 It is not exactly news that the world’s economic centre of gravity is shifting east. But it is striking how fast this seems to be happening. In a new study on the economic impact of urbanisation the McKinsey Global Institute, the research arm of the eponymous consultancy, has attempted to calculate how this centre of gravity has moved since AD 1 and how it is likely to move until 2025. Although the underlying maths (which involves weighting the approximate centre of landmass of a country by its GDP) has to be taken with a pinch of salt, the calculations show that the centre is rapidly shifting east—at a speed of 140 kilometres a year and thus faster than ever before in human history, according to Richard Dobbs, one of the authors of the study. The main reason for this is rapid urbanisation in developing countries, in particular China. Fifty-seven percent of Chinese adults surveyed in 2011 — before the country’s economic slowdown grabbed headlines — prioritized protecting the environment, even at the risk of curbing economic growth. About one in five believed economic growth is more important. Chinese attitudes are typical of those in other emerging-market economies, where residents sided with the environment over the economy in earlier surveys. Similarly, Americans historically prioritized environment protection over economic growth from 1985 to 2008. However, economic growth has taken priority since the economic recession deepened in 2009. If China’s economic troubles worsen, residents’ attitudes could change too. Ever wondered where gets most Official Development Assistance per capita in the world? Have a guess. Somewhere in sub-Saharan Africa? Nope. The Occupied Palestinian Territories? Uh-uh. Somewhere that’s recently had a huge humanitarian disaster? You’re still way off. In fact, it’s the place in the photo above – that’s the French dependency of Mayotte, in case you’re wondering, which in 2009 received the princely sum of US $2,751 per person in ODA. Now, you’re probably assuming that this is just some strange anomaly to do with France’s generosity towards her overseas colonies. But in fact, numbers 2, 3, 4 and 5 in the top five most heavily aided places on the planet are also small island states – and by no means are they all French possessions. Tuvalu gets $1,785 per capita; Palau, $1,737; the Marshall Islands, $1,101; and the Federated States of Micronesia, $1,093. In fact, no-one else managed to get over the $1,000 per capita mark in 2009. The next nearest was the West Bank and Gaza, at $748 a head. If you’re wondering when an African country that’s not a small island state gets a look in, then you’re looking at Djibouti – all the way down at $186 a head. Oh, and newsflash – none of the above are low income countries. In fact, you have to get to number 24 on the list of countries that get most ODA per capita – that’s Afghanistan – before you find a low income country. But who ever said life was rational?